This compact microphone is designed to transform the latest smart phones and MP3 players into a portable sound recorder. It provides improved sound quality and range when recording conversations or interviews in low to moderate level environments, like classrooms and office meeting rooms. This microphone is not intended for use in loud environments, such as concerts or sports events, because it is too sensitive and your audio will clip. Use with VeriCorder's Voddio App to create sophisticated audio projects on your iPhone, iPad or iPod touch devices. Due to changes in the headset jack circuitry in iPhone 5/5C/5S devices, the default input audio gain is set significantly lower in these devices wrt iPhone 4 devices. This will result in much lower audio levels being recorded when you use external microphones, like our Mini Mic. With the VeriCorder Voddio App you can raise the input audio gain as needed on any of these devices while making Audio recordings. However, we are not able to do so when making video recordings. To eliminate interference when you are recording, we recommend that you put your iPhone in Airplane Mode and make sure that the WIFI radio is OFF as well, before you start. 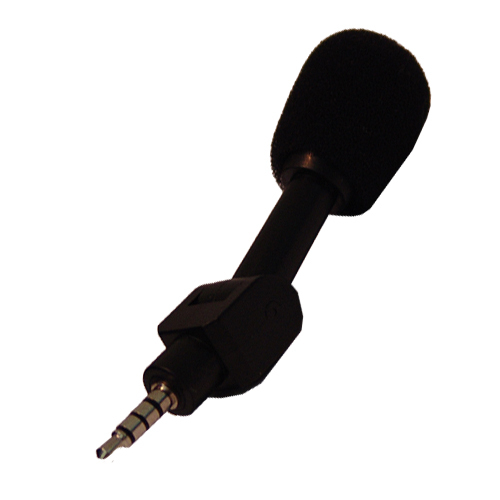 The Mini Mic works with many smart phones or MP3 player that have a 3.5 mm, four-conductor headset jack, such as : iPhone, iPad, iPod touch; Blackberry, Nokia and many Android cellphones. Click the button below to add the Mini Mic for iPhone to your wish list.